Home and Garden Console Table by Aldgate Home. We designed and completed this piece as it fits so well with our mirror collection. Suitable for home and garden display this feature table works well displayed stand alone or situated beneath one of our mirrors. 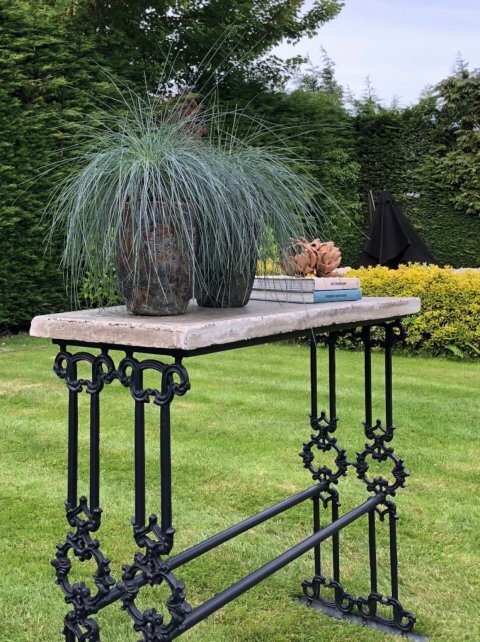 Constructed from a cast iron work decorative base, shown here in a matt aged black paint finish .With circular width base bars that can be used as a further display space. Offered with a choice of natural textured tops to complete this designed piece. Hand poured textured natural concrete top adds beautiful unique charm to this table. Light and darker granite top pieces or marble all work well to make this a wonderful feature for the home and garden. We can offer different lenghts to suit your space. We can complete the cast iron base work to a colour of your choice. Please do enquire for a detailed quotation to meet your specification. Images show our natural hand poured textured concrete top. We offer our perosnal delivery and postionsion service if required.